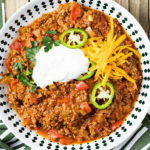 Home » Recipes » Best Low Carb Keto Chili – How to Make Paleo Chili? Best Low Carb Keto Chili – How to Make Paleo Chili? 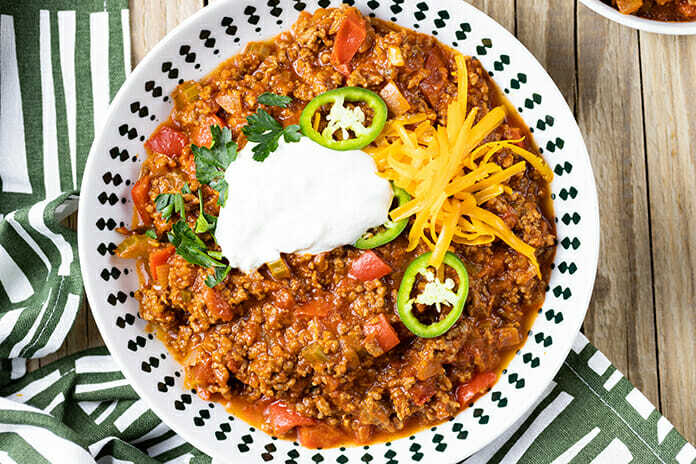 This low carb keto chili is a mouthwatering combination with no beans, and you can make it in an Instant Pot, Crockpot or on the stove. Perfect for meal prep, it is easy to make dinner to enjoy with the whole family. I love that this chili has tons of vegetables that go perfectly with the meat. There’s no need for beans of any kind even they are an important ingredient in the original recipe. If you are looking for a way to include more vegetables in your meal plan, this is a great way. You’ll never want to make chili with beans ever again. To give a little more texture to this keto chili I’ve added red pepper. The ingredient list might seem long but half of them are spices, so don’t work this is still very easy to make keto recipe. Low carb vegetables such as onion, celery, garlic, red pepper. Seasonings: chili powder, ground cumin, bay leaves, oregano. Turn your Instant Pot to sauté add the olive oil. Add the onion, celery, garlic and sauté until tender, for about 2-3 minutes. Add the ground beef and cook until browned. Drain any excess grease using a large spoon. Add the seasoning and the remaining ingredients and stir to combine. Allow the pressure to release naturally for 10 minutes, then quick release. Remove the bay leaf before serving. To make chili in the crock pot you start by cooking the onion, celery, and garlic in the tablespoon of olive oil, until translucent. Add the ground beef. Break it up as is cooks with a spatula, stirring frequently until browned. In the slow cooker add the tomato crushed tomatoes, stir in the seasonings. Add the cooked ground beef-onion mixture and the rest of the ingredients. If the chili looks too thick stir in more water. Cook on low for at least 4-6 hours. If you don’t want to make the chili in an Instant Pot or in a slow cooker you can cook it in a large soup pot. For the instructions check the recipe card down below. I usually count net carbs because the fiber and sugar alcohols from the foods aren’t absorbed and don’t affect insulin levels. 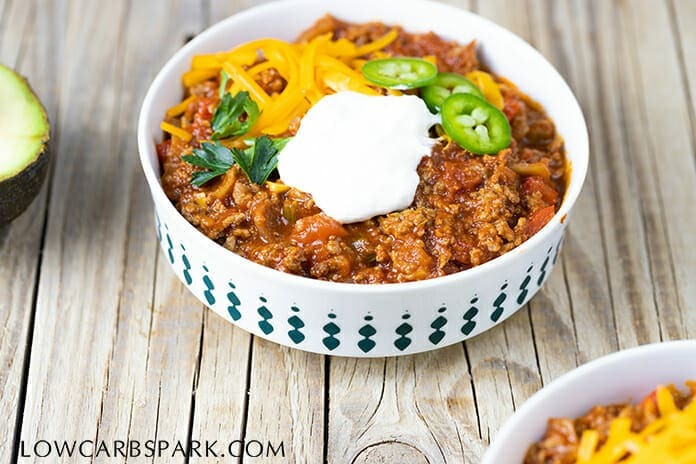 How many carbs are in keto chili? 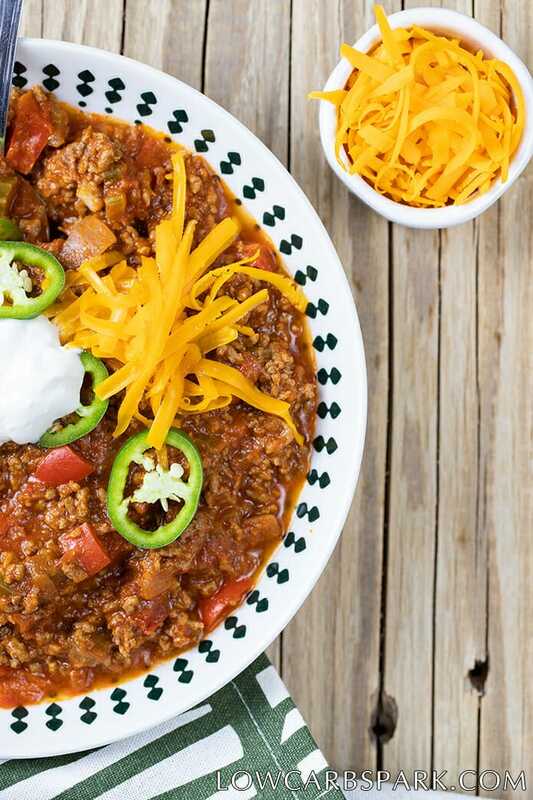 This keto chili makes enough for 6 servings. Each serving of about 1 cup has 7g net carbs. If you are counting total carbs this recipe has 9g carbs for one serving. 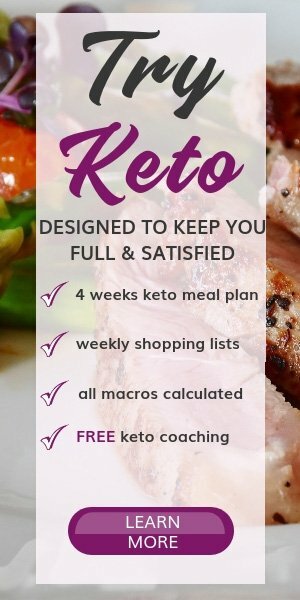 Are tomatoes good to eat on a keto diet? 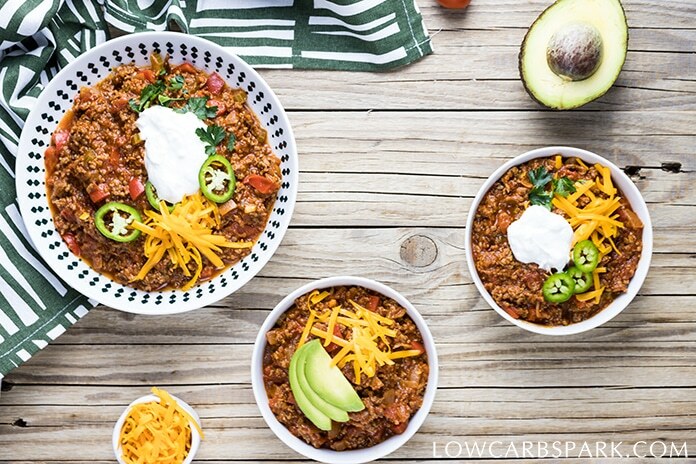 How to serve low carb chili? How to freeze keto chili? Keto Chili is really freezer friendly. Let your chili completely and store in Ziploc bags with all the air pressed out. 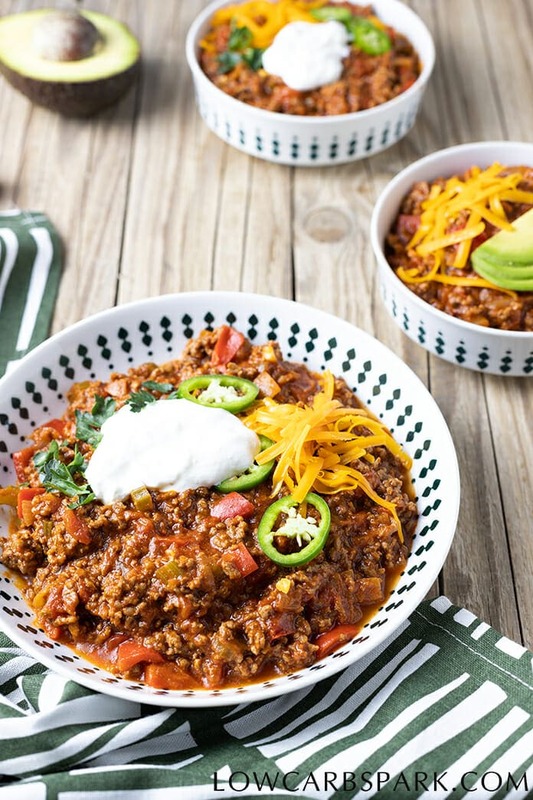 This keto chili recipe is perfect for the whole family because it’s tasty, low carb, keto, and paleo. Enjoy a rich freezer friendly meal. In a large pot over medium high heat add the olive oil. Cook the onion, celery, and garlic for about 5 minutes. Add the ground beef and break it apart with a spatula. Cook for about 8-10 minutes or until the meat is browned. Bring the mixture to a boil, then reduce the heat (low to medium) and simmer the keto chili for about 25 minutes, occasionally stirring. Add more seasonings to taste. Let the chili rest for a few minutes before serving. 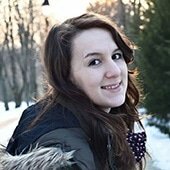 Thanks for the recipe Ioana. I haven't made a chili since being keto and I'm looking forward to giving it a try. It says a Can of crushed tomatoes but is it the 28oz can or the smaller one? IT’s the 28oz one. I just added it this detail. Thank you, Donna! Do you drain the Beef once cooked? Do you drain the can of tomatoes first? If there’s too much excess fat, you can drain the beef before adding tomatoes.